Microsoft's workforce is 73.4 percent male, and 55.1 percent white. Microsoft showed a small increase in the proportion of women in its employee ranks, rising 1.1 percentage points to 26.6 percent, from 25.5 percent last year. The Redmond company released a report on its workforce demographics Wednesday, revealing global gender numbers and U.S. ethnicity numbers as of June 30. It increased representation in basically every category of minorities, each by a small bump. 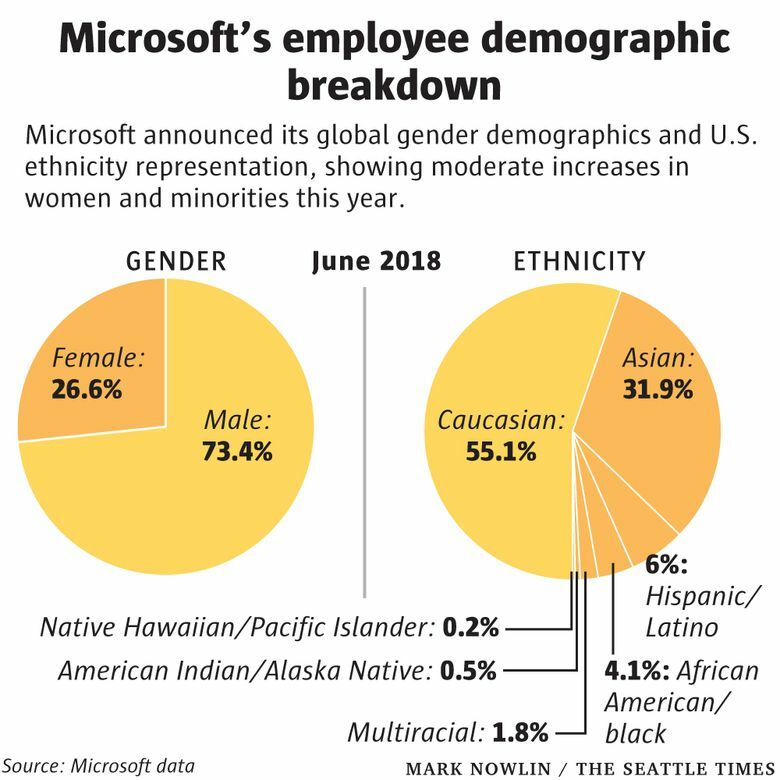 Microsoft has revealed its demographics each November for the past few years, after increased scrutiny of the tech industry caused many Big Tech companies to offer a window into their diversity efforts. The companies are largely white and male, especially in technical and leadership roles. Microsoft is reporting its demographics as of June 30, to align with its fiscal year, rather than its previous date of the end of September. The numbers aren’t comparable with last year’s reported percentages because of the date change, but Microsoft provided comparisons for the new date. Women’s representation gets a small boost when Microsoft’s workforce is combined with employees at LinkedIn, the professional-networking site Microsoft acquired two years ago that operates largely independently. The combined companies have nearly 135,000 employees across the world, and women make up 28 percent of the workforce, an increase from 27 percent at the same time last year. In Microsoft’s U.S. ranks, African-American and black employees make up 4.1 percent, up from 3.9 percent last year. Hispanic and Latinx employees represent 6 percent of the U.S. workforce, up from 5.8 percent last year; and Asian employees make up 31.9 percent, up from 31.0 percent. Women now make up 19.9 percent of employees in technical roles, up from 18.5 percent last year. And the leadership ranks are 19.7 percent female, an increase from 18.8 percent last year. The modest increases mean that Microsoft’s workforce is 73.4 percent men, and 55.1 percent white. Other tech companies have similar statistics, including Google, which has a workforce of 69.1 percent men, and 53.1 percent white employees, according to numbers reported this summer. Facebook also reported this summer that its workforce is 63.7 percent men and 46.6 percent white. 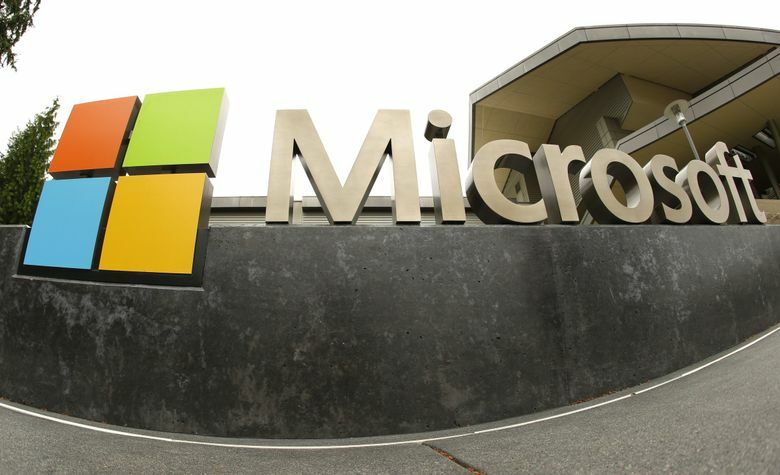 Microsoft is facing a gender-discrimination lawsuit brought by three former and present employees, who claim that they and other women were promoted slower and given fewer raises than their male peers. Women inside the company have said the tech firm still feels like a boys’ club in many ways, and it can be isolating. McIntyre says Microsoft remains committed to diversity and inclusion at the company, and has made it a core focus for employees. Workers get training to combat unconscious biases and managers are evaluated on the diversity of their teams. That includes several hiring programs that look for talent beyond four-year colleges, as well as STEM training programs for girls, she said. Microsoft also has eight employee-resource groups — representing such groups as women at Microsoft, LGBT employees and a recently added group for veterans — to make them feel part of the company. Inclusion, or making employees feel valued and comfortable at work, is a necessary and important piece of the puzzle, said Kathleen Hogan, the company’s human-resources chief. Recently, her team participated in a workshop about privilege and understanding where other people are coming from. Hogan acknowledged earlier this month that the company had moved forward, but had a significant amount of work to do.